Billy Big Daddy Cade's natural guitar talent & soaring voice had proven worthy to the legend B.B. himself so much so that he was officially sanctioned & brought on to work at "Legends" B.B. Kings Nightclub in Las Vegas, in their world wide review as the one and only B.B. King. "Cade has the look, has the voice, and his guitar style is as close to the real thing that one could ask for. When this man takes the stage, Cade Is B.B. King!" said the Las Vegas Sun. "Big Daddy" feels God gave him a gift to play the guitar and enjoys entertaining his friends, family and fans. He is always appreciative of his fans and spends many hours working with and encouraging young musicians to find their way into the blues. Before hooking up with B.B. King Charles Dennis, or "Charlie Tuna' as he is often called, performed with the Legendary soul bluesman Bobby "Blue" Bland. 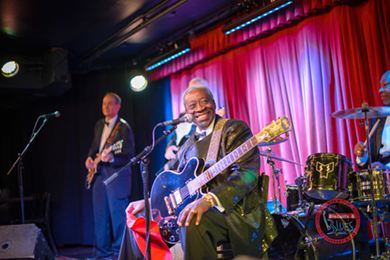 He also led his own band which was a Las Vegas Blues mainstay for many years, but it is his fourteen year stint as the rhythm guitarist for the King of the Blues, Mr. B.B. King which brought Charles Dennis in front of countless sold out shows across the country and placed him on some of the biggest stages in the world including the Royal Albert Hall. Charles was the second and final rhythm guitar player for the King and performed upwards of 250 gigs a year almost up to the King's passing in 2015. Big Daddy Billy Cade made his Twin Cities debut striding onto stage in a black tux and carrying his black and white Lucille style guitar. Before his long set of the King of the Blues music, he heated up the large crowd at Famous Dave's with a tight set of smoking blues featuring his hot, expressive guitar, strong, husky vocals, and a large, tight backing band. Having two veteran keyboard players on B-3 and electronic keyboards, three talented sax players, a capable bass player, and a talented, energetic young drummer made for a great ensemble sound. Big Daddy captured the entire rooms right away with his playing and his presence. Kicking things off with "Looking for a New Kind of Love" his smoking guitar and strong, passionate vocals had the crowd responding with enthusiasm. Big Daddy can play blues classics funky with his own spin, as he did on "Sweet Home Chicago" by using the wah-wah peddle and stinging, driving guitar licks backed by great B-3 organ playing by James "Hurricane" Hackney and the swinging edge of his three horns. Big Daddy can also play it straight-forward, as on the Albert King classic "I Play the Blues for You." Big Daddy has great tone with his stinging guitar riffs, playing some nice, hard hitting, soulful notes that would have pleased Albert. But it was the B. B. King tribute the entire second set that really kicked the crowd into high. After two brief warm-up numbers, solidly played by the large, talented blues band, Big Daddy strode out in his black and gold tuxedo jacket and black framed sunglasses looking uncannily like a young B. B. King. He proceeded to heat up the house with "Rock Me Baby," sometimes sounding more like B. B. King than the King does himself these days. With his expressive, ringing guitar licks delivered with the style, sound, and spirit of the original, Big Daddy had become B. B. He has all the little mannerisms down, from how he moves on stage, addresses the crowd, sings, and plays guitar. Big Daddy even closed out the song with a flourish on guitar, leaving one last, echoing note to hang in the air. The impressed crowd clapped and cheered their approval enthusiastically.